Superintendent of Public Instruction Tony Bennett chats with State Board of Education member Tony Walker before the panel's meeting Wednesday. Scroll down to find what grade your school received — we included results for all traditional public, charter and private schools. Fewer Indiana schools received the state’s highest performance rating this year compared to last year, according to letter grades Indiana Department of Education officials released Wednesday. Forty percent of Indiana schools received an A, down from 47 percent in 2011. But one in five schools received B’s this year, up more than 10 percentage points from last year. 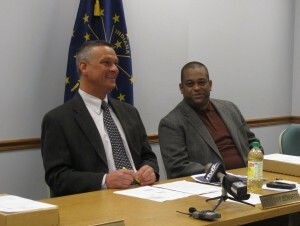 “This is a very positive day overall, very positive news,” Indiana Superintendent of Public Instruction Tony Bennett said during the State Board of Education meeting in Indianapolis Wednesday. Members of the executive panel approved the grades unanimously shortly thereafter. A slightly higher percentage of schools received F’s — 7.1 percent of schools this year, as opposed to 5.3 percent of schools receiving the state’s lowest rating last year. 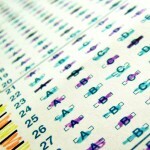 The formula still uses results of statewide tests — the ISTEP+ in elementary and middle school or the End-of-Course Assessments (ECAs) in high school — to compute the ratings. But state officials say the new model places more emphasis on individual students’ academic growth, rewarding schools who are helping students make greater gains but penalizing schools where students are stagnating or declining. At the high school level, the model also factors in graduation rates and the number of students taking college or career preparation courses for credit. The new model has been controversial. In February, a broad coalition — including some of the state’s traditional allies — voiced deep concerns about the way state officials set up the new model. Some district administrators have criticized the IDOE for what they call delays and errors in the process of calculating the grades. State officials says it lengthened appeals windows to ensure all districts’ concerns were addressed. Use the table below to the 2012 school letter grades for all Indiana schools — traditional public, charter, and private. Click on the arrows to sort the table by county, corporation name, school name or score. Type in the “Filter” box to search by county, corporation name, school name or score. You may click through the pages of data by clicking on the “Previous” and “Next” buttons on the bottom of the table. *NOTE: We’ve included 2008, 2010 and 2011 school ratings as a reference. These were all calculated using a different model. **The 2010 and 2008 ratings were not originally issued in letter-grade form, but for ease of comparison, we changed the original labels (which you can see here) to the current letter grade format.